J & J Cedar Mill, Inc.
J & J Cedar Mill strives to supply you with the highest quality cedar lumber products. We hope your experience can be one that’s enjoyable and informative as you explore our website. Thanks for taking the time to visit us and considering our fine line of products! Our business specializes in the production of eastern white cedar lumber to supply the fence industry, the log home industry, and other related markets. A large portion of our sales consist of rough wholesale markets, however, we also retail these same products to smaller customers. We also offer a wide range of custom sawn products to those who have unique or special needs. Virtually, any need that you have requiring the use of eastern white cedar we’re ready to consider. Whether it’s rough, dressed, trimmed or otherwise, we will try our best to meet your needs. We are a small family owned company operating in the town of Bridgewater, Maine of Northern Aroostook County. We have a total employment of fifteen. Please refer to the company history section of this website for more details about who we are. How We Operate. 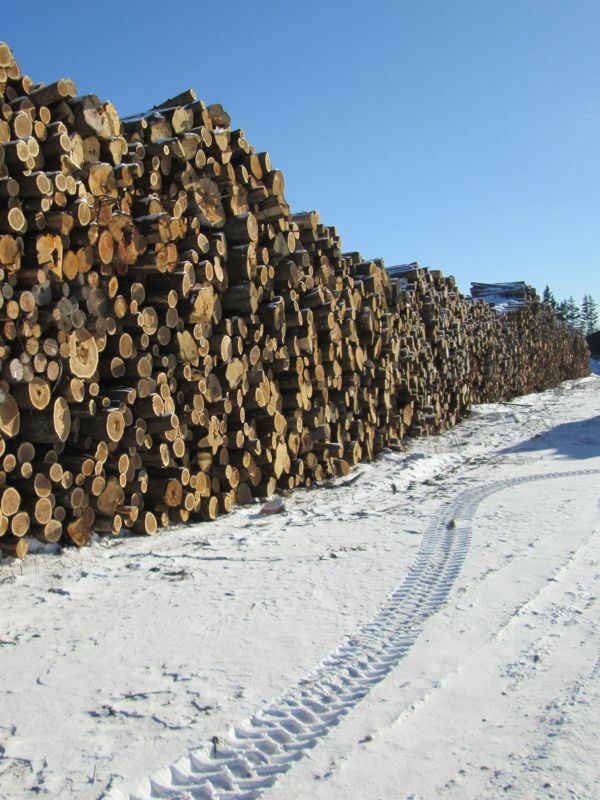 . .
We procure the raw material that is needed to keep our facility running from many of the local forestry operations in the area and also from the New Brunswick, Canada area just a few miles across the border from our manufacturing plant. Raw material is stocked on our yard mainly in tree length form, however we do purchase a certain volume in log length to fulfill the needs of the plant. We process this raw material into lumber of all sizes, lengths, and grades. We work with other companies that manufacture and build components using eastern white cedar. Most of the lumber we sell is only a rough ingredient that is processed further into a finished product that is marketed mainly in the eastern United States. © Copyright 2012-2019 by J & J Cedar Mill, Inc.